The Centre for Oral History and Digital Storytelling, in co-sponsorship with the Feminist Media Studio, will host a workshop facilitated by Sara Kindon on March 17. In this workshop, Sara will facilitate an exploration of the joys and challenges of working with arpilleras to explore women’s experiences of migration, displacement and belonging. Arpilleras are brightly-colored patchwork pictures made from scraps of fabric. They were originally made by groups of women to ‘speak’ out against human rights abuses under the military dictatorship in Chile (1973-1990). Since then, they have been made by women around the world fighting social and environmental injustice. After the first-ever exhibition of Chilean arpilleras in New Zealand in 2013 as part of the Third International Visual Methods Conference, Sara and her colleagues Dr Marcela Palomino-Schalscha and Ms Katia Guillof have been tracing their effects on those who attended and participated in the exhibition. 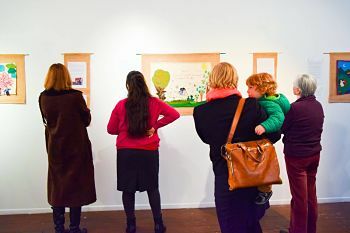 One major effect has been the establishment of a group of Wellington-based arpilleristas with whom we have carried out oral history interviews, participated in sewing and discussion workshops, and held an exhibition of our own arpilleras. This COHDS workshop provides participants with an opportunity to learn more about this project, as well as to explore potential benefits and challenges of working in this way for their own contexts. Sara Kindon is an Associate Professor in Human Geography and Development Studies in the School of Geography, Environment and Earth Sciences, Victoria University of Wellington, New Zealand. As a social geographer, Sara has focused on the practice, theorization and publication of participatory geographic research drawing on community-based fieldwork in Costa Rica and Indonesia, as well as collaborative projects with Indigenous Maaori and refugee-background communities in Aotearoa New Zealand. She has published widely and is on the editorial board of several prominent Geography journals. Sara is at Concordia University as a Lillian Robinson Visiting Scholar in the Simone de Beauvoir Institute.